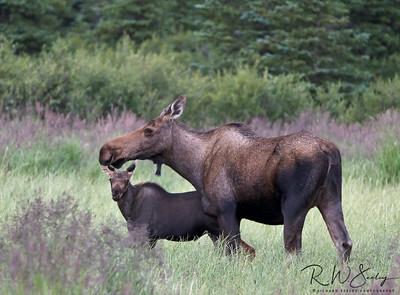 The moose is the largest member of the deer family and the tallest mammal in North America. 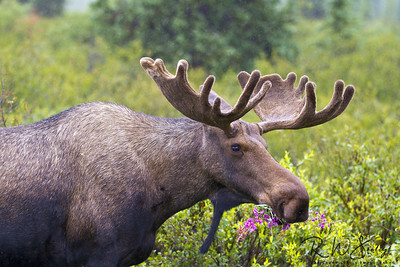 It stands six feet tall from shoulders to feet. 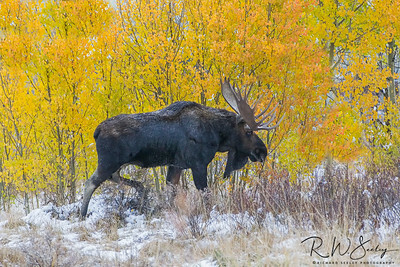 Like Father, Like Son - A bull moose and calf pair enjoy breakfast together on a crisp morning in the fall surrounded by the colors of autumn. 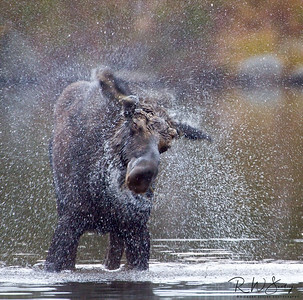 Moose Shake - A cow moose shakes her head to remove water from Sandy Stream pond in Baxter State Park, Maine after dipping her head in the icy cold water searching for vegetation to eat. 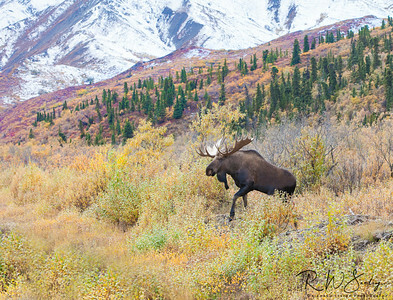 Moose Munch - A young bull moose with velvet still on its new antlers munches on fireweed in Denali National Park, Alaska. 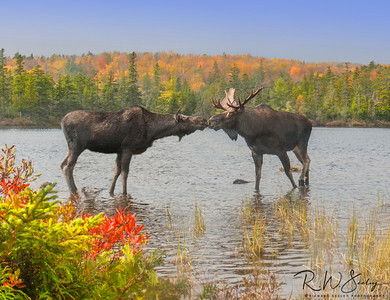 Moose Smooch - A cow and bull moose touch noses in a show of affection during the fall mating season. 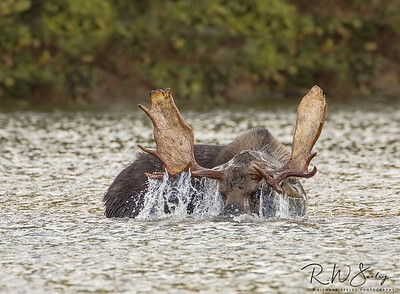 Paddles Up - A bull moose with very large antler paddles dunks his head underwater in search of vegetation to eat. 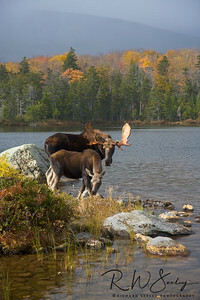 Sandy Stream Pond, Baxter State Park, Maine. 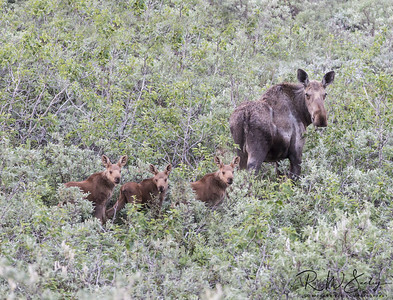 Under Mom's Protection - A mother moose stands between her calf and potential intruders in Denali National Park, Alaska. 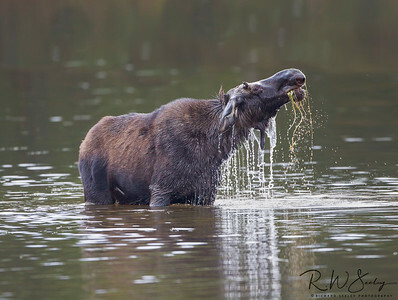 Wading For Breakfast - A bull moose wades out into a pond and eats the vegatation from the bottom of the pond. Sandy Stream Pond, Baxter State Park, Maine. 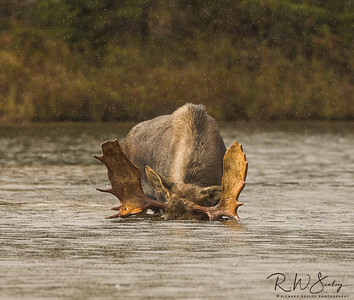 Up To Its Nose - Water drains from the antlers of a bull moose as it raises its head from underneath the surface of the pond. Sandy Stream Pond, Baxter State Park, Maine. 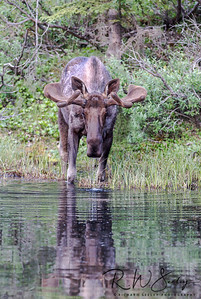 Eating My Veggies - A cow moose lifts its head out of the pond with water and vegetation dripping. 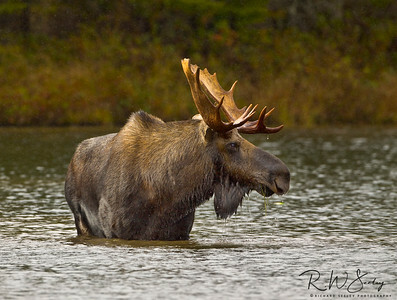 Sandy Stream Pond, Baxter State Park, Millinocket, Maine. 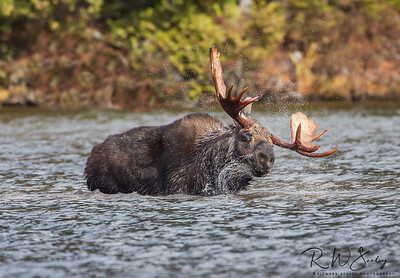 Rack and Roll - A Bull Moose shakes its head and antlers to remove water after lifting head from under pons surface. Sandy Stream Pond, Baxter State Park, Maine. 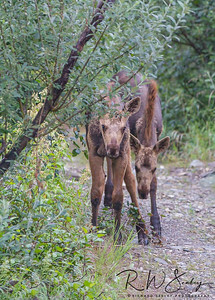 Mischievous Moose - Two moose calves are curious as to why anyone would want to take their picture in Kantishna, Denali National Park, Alaska. 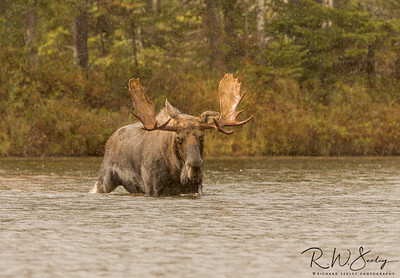 Rain Date - A bull moose wades through the water in search of a cow moose during the fall mating season in the rain. 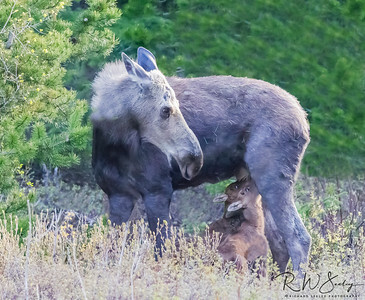 Baxter State Park, Millinocket, Maine.